Larry Chamberlain, of Grace Brethren Investment Foundation and the Eagle Commission, says, “[Here] is an email received today from Chaplain David Mvondo, who is completing his one-year tour in Iraq. The attached picture is a great reminder of why we pray for our Grace Brethren chaplains and the soldiers under their care.” The web address for the Eagle Commission is www.eaglecommission.org. These are our last days in Iraq! We are thankful to the Lord for what He did for us this past year in Iraq. He has been good to us! In just a few days, we’ll start our long and tedious trip back to the US. Please, pray for us that God would grant us travel mercies. God willing, we’ll be back in the US next week. 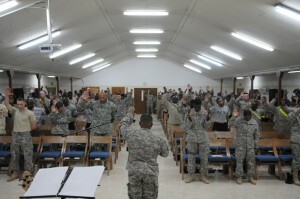 Attached is a photo of one of our last services here in Iraq. For three days, We had revival meetings. Hundreds attended during those three days. Several people gave their lives to the Lord for the first time and others just rededicated their lives to Him. We are very thankful to have been part of the Lord’s work here in Iraq for the last 12 months. We thank all of you who have been praying for us. It is because of those prayers that some of what we did here took place. Blessings to you all!